The National Union of Railwaymen (NUR) was formed in 1913 by the amalgamation of the Amalgamated Society of Railway Servants of England, Ireland, Scotland and Wales, the General Railway Workers' Union and the United Pointsmen's and Signalmen's Society. The Amalgamated Society of Railway Servants of England, Ireland, Scotland and Wales was the dominant partner in this amalgamation. In 1990 the National Union of Railwaymen amalgamated with the National Union of Seamen to form the National Union of Rail, Maritime and Transport Workers (RMT). The Modern Records Centre holds the main archives of the NUR. This collection contains many thousands of documents covering the whole period of the union's existance - from the date of its formation to its 1990 amalgamation. 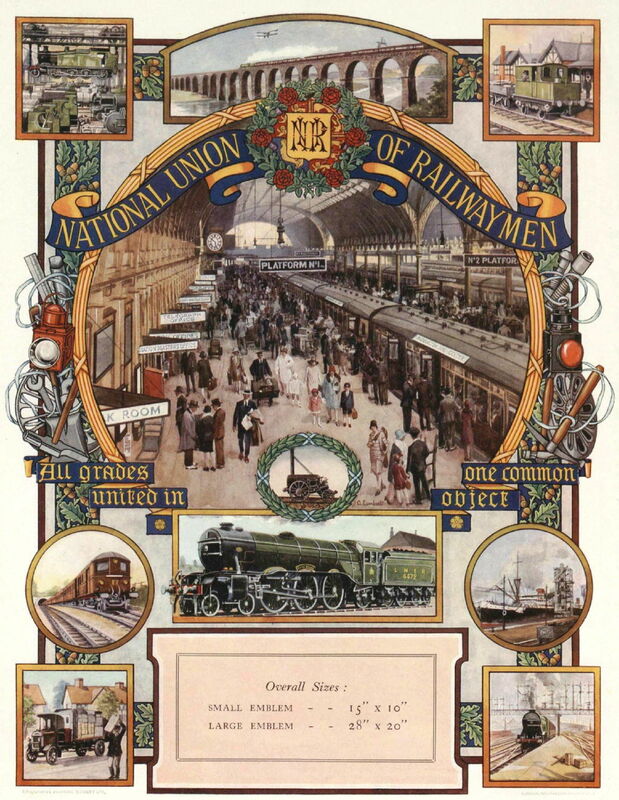 To commemorate one hundred years since the formation of the National Union of Railwaymen, we have selected examples of documents which illustrate significant events during the history of the union. A 1938 supplement to the Railway Review, produced to mark the union's Silver Jubilee, is available online in full . An illustrated list of all the NUR General Secretaries, a selection of more unusual stories from the early years of the Railway Review and information about the limited membership records held at the MRC is available elsewhere on our website. The National Union of Railwaymen came into being on 29th March 1913, the result of the amalgamation of the Amalgamated Society of Railway Servants, the General Railway Workers' Union and the United Pointsmen's and Signalmen's Society. The new union immediately attracted new members - with membership rocketing from 159,261 at the time of amalgamation to 267,611 by the end of 1913. According to John Marchbank, General Secretary at the time of the union's silver jubilee in 1938, "the establishment of the NUR meant the accomplishment of something more than the unification of the unions; it put a stop to that slow growth which had hitherto characterised railway trade union development. Until the N.U.R. was formed it was never possible for any railway union to speak with the authority which goes with representative numbers ." 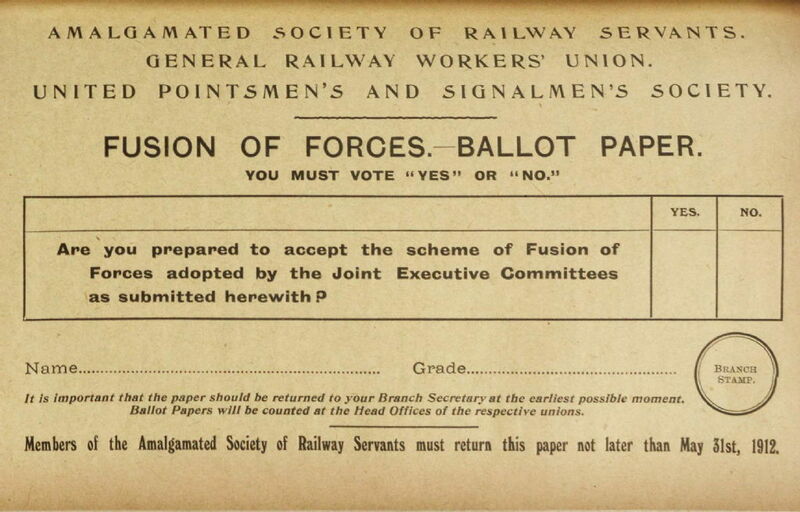 The document above is a ballot paper issued to members of the three unions on the proposals for the "fusion of forces", and is included in the 1912 reports and proceedings of the Amalgamated Society of Railway Servants [document reference: MSS.127/AS/1/1/45]. Discussions on amalgamation grew out of the 1911 national railway strike, which saw four key railway unions (the ASRS, GRWU, UPSS and the Associated Society of Locomotive Engineers and Firemen) combine in a dispute for the first time. ASLEF was also involved in the first post-strike discussions on fusion, but left the talks after its proposals for a looser federation were not adopted. At the start of the 20th century, many within the trade union movement opposed the "dilution" of the workforce through the employment of women, not least because the lower pay women usually received undercut the wages of male workers. The enlistment and conscription of nearly a quarter of the male population during the First World War, led to the employment of women in a range of occupations that had previously been closed to them, including work on the railways. In recognition of this, the June 1915 annual general meeting of the National Union of Railwaymen altered the union's rules to allow women to become members for the first time. 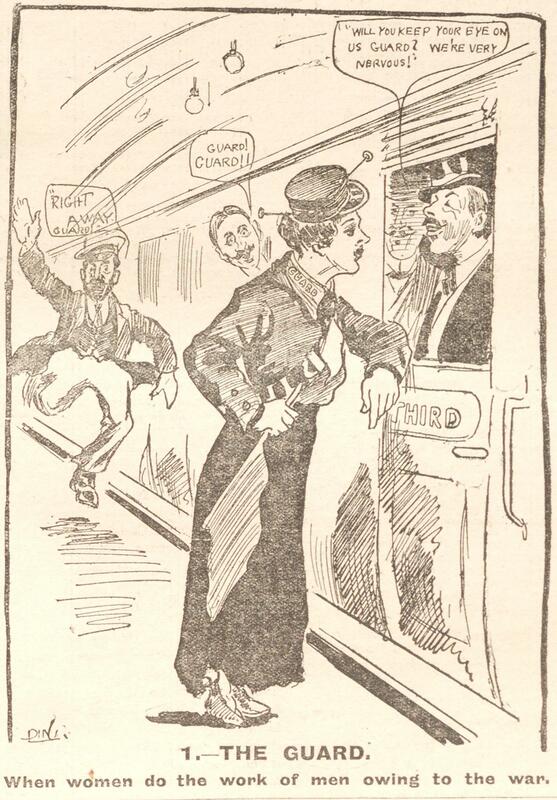 During 1915, the NUR's journal, the Railway Review, ran a short series of cartoons commenting on the novelty of women as railway workers (with the snappy title 'When women do the work of men owing to the war'). A typical example is shown on the left, taken from the 26 March 1915 edition [document reference: MSS.127/NU/4/1/3]. The 1914-1918 membership registers of the National Union of Railwaymen provide a clear illustration that women railway workers were seen as only a temporary, emergency measure - entries for women workers were written in red ink, rather than the standard black. Cartoons from First World War editions of the Railway Review have been digitised and are available online elsewhere on the Modern Records Centre website. These include satirical comment on railway working conditions and management, wartime social problems (including profiteering and food shortages), the introduction of women workers, the 1918 general election and plans for post-war reconstruction. For the duration of the First World War and its immediate aftermath the railways were removed from the control of private companies and managed by the National Government. During the war, the NUR and ASLEF negotiated jointly with the government to win wage increases for railway workers, although at levels below the high rate of inflation. In March 1919 the government announced its plans to standardise and reduce the wartime rates of pay and, after failed negotiations with the unions, the second national rail strike began at midnight on 26-27 September 1919. A key feeling during the strike was that sacrifices made during the war had not been acknowledged by the government - in the words of the NUR General Secretary, J.H. 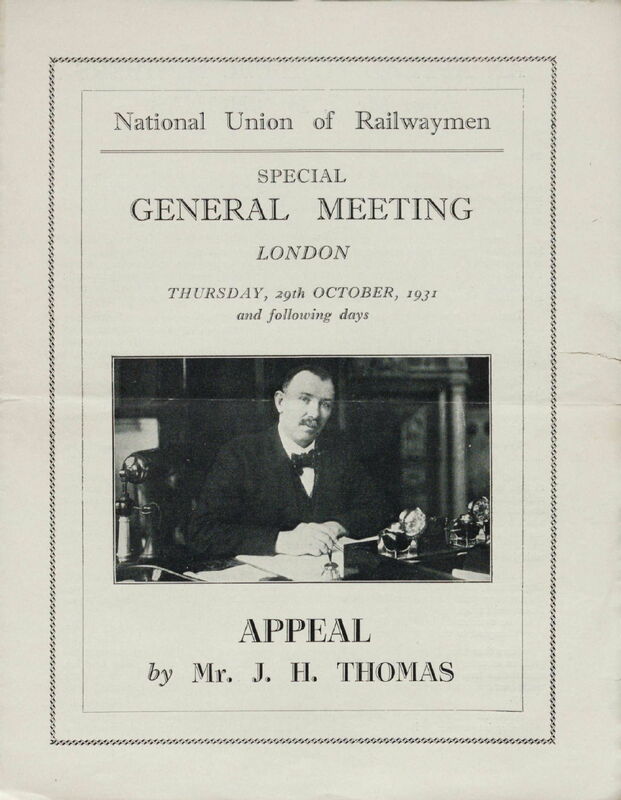 Thomas, "the short issue is that the long made promise of a better world for railwaymen which was made in the time of the nation's crisis, and accepted by the railwaymen as an offer that would ultimately bear fruit has not materialised ". After nine days of strike action by the NUR and ASLEF, the government agreed to maintain wages at existing levels for another year. Subsequent negotiations resulted in the standardisation of wages across the railway companies and the introduction of a maximum eight hour day. The document on the left is the 'Victory Number' of the Glasgow and District Railwaymen's Strike Bulletin, produced by the Glasgow and District Railwaymen's Strike Committee (a joint committee containing members of both the NUR and ASLEF) [document reference: MSS.127/NU/IN16]. It hails the "great labour triumph" over "the most despotic Government this country has ever seen", and details the terms of the settlement. Two circulars issued by the NUR before and after the strike are also available online . The General Strike was the largest industrial dispute in Britain’s history and lasted for a total of 9 days – between 3 May 1926 to 12 May 1926. It was called by the Trades Union Congress to support the Miners’ Federation of Great Britain in their dispute over the cancellation of national agreements, reduction of wages and increase in working hours imposed by mine-owners. 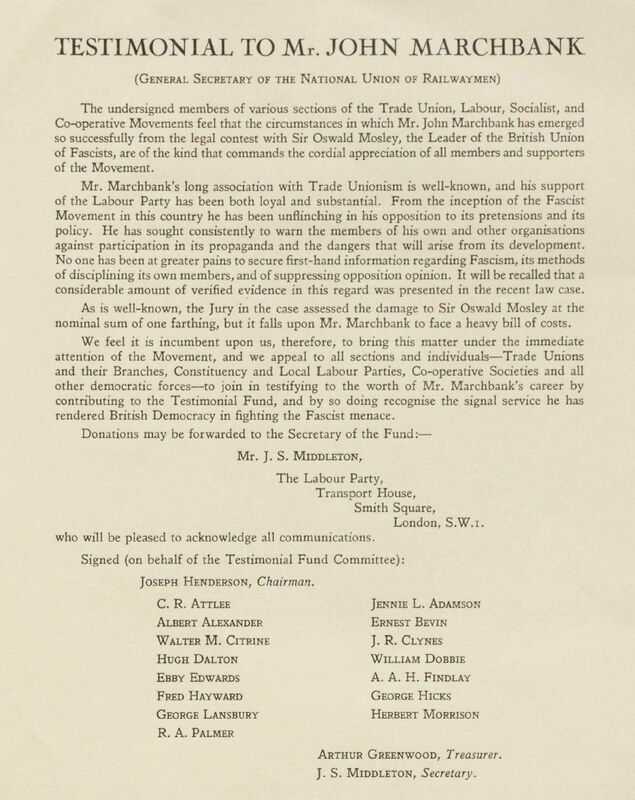 As a member of the Triple Alliance (formed in 1914 between the National Union of Railwaymen, the Miners' Federation of Great Britain and the National Transport Workers' Federation) the NUR played a leading role in the strike action. The document on the left is one of a series of news bulletins issued by the National Union of Railwaymen Head Office to branches and secretaries of strike committees. It hails the General Strike as "the biggest struggle in which the Working Classes have yet been engaged" and the NUR action as "100 PERCENT EFFICIENT" [document reference: MSS.127/NU/GS/3/102]. 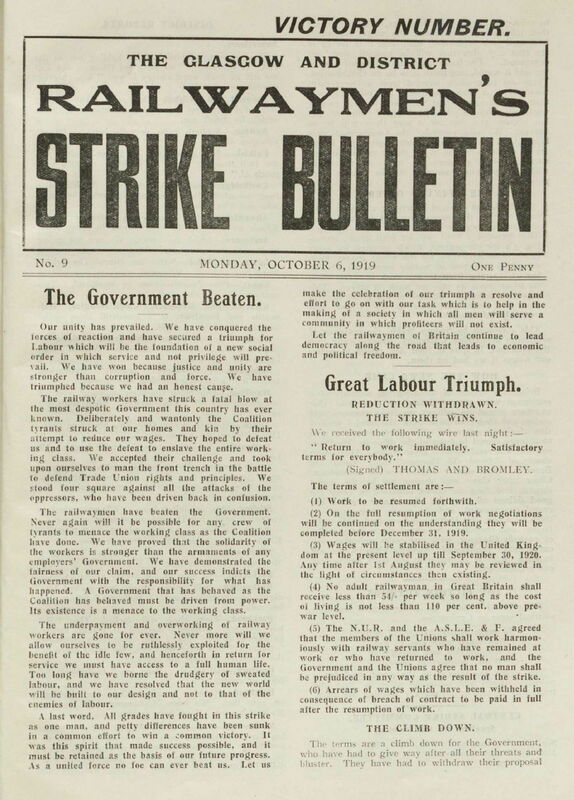 The Modern Records Centre holds many key archives relating to the General Strike. 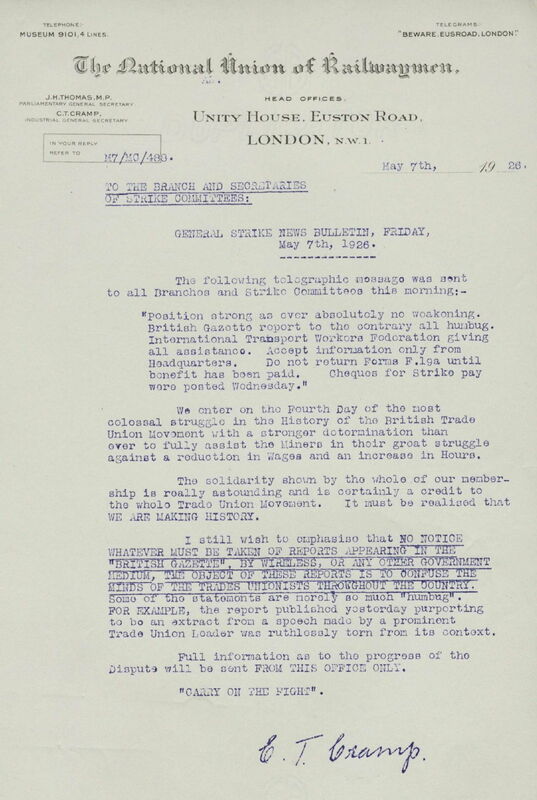 A selection of strike bulletins, transcripts of radio broadcasts, photographs and other documents have been digitised and are available online. These include information about the running of the railways during the dispute. Between 1910 and 1931 J.H. Thomas played a prominent role in both the trade union movement and the Labour Party - being elected Labour MP for Derby and Assistant Secretary of the Amalgamated Society of Railway Servants in 1910, becoming NUR General Secretary in 1917 and serving as Colonial Secretary, Lord Privy Seal and Secretary of State for the Dominions in the 1924 and 1929-1931 Labour governments. This dual role came to an end in 1931, when Thomas joined the Prime Minister James Ramsay Macdonald and Chancellor of the Exchequer Philip Snowdon in the coalition National Government, which imposed stringent cuts on public services. All three were condemned as traitors to the labour movement, and Thomas was expelled from the Labour Party, removed as NUR General Secretary and stripped of his union pension. He was forced to resign from the National Government in 1936, after allegedly leaking information about the Budget to speculators. The document on the left is a printed appeal to NUR members issued by J.H. Thomas in 1931, before a special general meeting of the union was held [document reference: MSS.127/NU/GS/3/3]. He attempts to justify his actions by arguing that to resign from the Cabinet would have "brand[ed] myself a coward" at a time of "great national calamity", and suggests that "the outstanding successes which I helped to achieve for railwaymen have undoubtedly been the cause of many of the differences and jealousies with which I have had to contend in our Movement". A profile of J.H. Thomas is included in the 1924 pamphlet Labour's Great Record: An outline of the first six months' work of the Labour government . Criticism of the National Government is included in the Associated Society of Locomotive Engineers and Firemen's Political notes for union speakers in the general election and the Trades Union Congress and Labour Party's manifesto on the financial crisis , both produced in 1931. In 1936 the General Secretary of the National Union of Railwaymen, John Marchbank, was sued for slander by the leader of the British Union of Fascists, Sir Oswald Mosley. Mosley objected to reports of a speech Marchbank had made in 1934, which had referred to the use of violence by fascists against audience members at a notorious meeting at Olympia, London, and supposedly suggested that these actions was sanctioned by the leadership of the BUF. Marchbank claimed that the reports were inaccurate, denied slander and, over the course of five days, used his defence to publicly give detailed examples of Blackshirt brutality. The evidence collected for the case, contained within the archives of the NUR, includes statements by former members of the BUF on the organisation's provocation of violence, purchase and use of weapons, and anti-semitism. Mosley won the case but was awarded only one farthing in damages (then the smallest coin in British currency - one quarter of one pence). The document on the left is a testimonial or appeal for funds to help pay John Marchbank's legal fees of £5,517 [document reference: MSS.127/NU/GS/3/7A]. The Testimonial Fund Committee included leading figures of the labour movement, such as Clement Attlee, Ernest Bevin, Walter Citrine, Hugh Dalton, George Lansbury and Herbert Morrison. As part of the NUR's 'Campaign Against Fascism', the Head Office sent examples of anti-fascist Labour Party literature to branches in 1934. Two of these are available online ('The Fruits of Fascism ' and 'The Spotlight on the Blackshirts '). In 1945 the Labour Party formed a majority government for the first time, having won a landslide victory in the first general election for ten years. A key part of their election programme was the nationalisation (transferral from private to state or government ownership) of industries and infrastructure considered essential to the running of the country. This ranged from hospitals and healthcare to heavy industry such as coal and steel, and included the national rail system - which, at a time when cars were expensive luxuries, combined both a vital economic and social function. The 1947 Transport Act provided the framework for the nationalisation of the railways and set the rates of compensation for the 'big four' railway companies (Great Western; London and North Eastern; London, Midland and Scottish; and Southern) and the London Passenger Transport Board. The new unified service, known as British Railways, started operation on 1 January 1948. 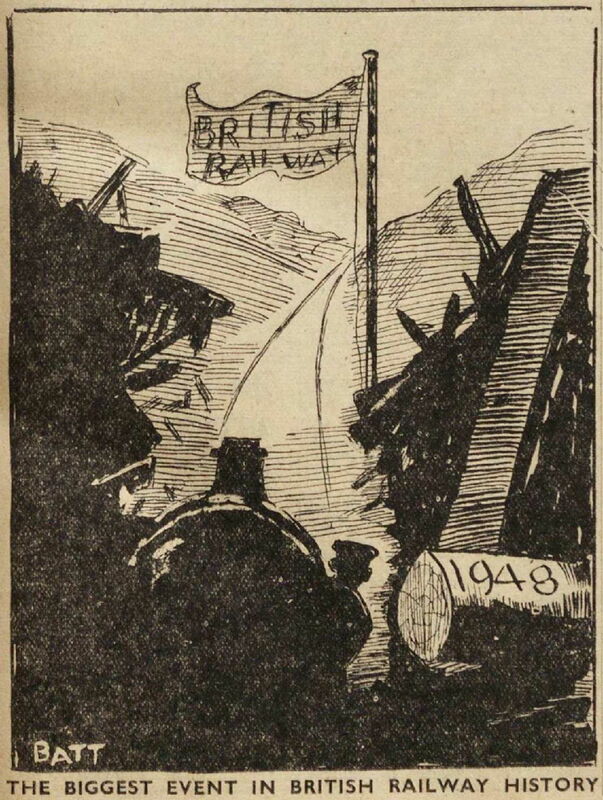 The cartoon on the left is taken from the 2 January 1948 issue of the Railway Review, and celebrates "the biggest event in British railway history" [document reference: MSS.127/NU/4/1/36]. The President's New Year message for 1948 included the appeal for members to ""Take off your coat, roll up your sleeves" and give of your best, in whatever capacity you may be engaged" in order to "make Public Ownership a success". On 4 November 1957, Jim Campbell and Tom Hollywood, the General Secretary and President of the National Union of Railwaymen, were killed in a road accident in Stalingrad, whilst on a goodwill mission to the Soviet Union. 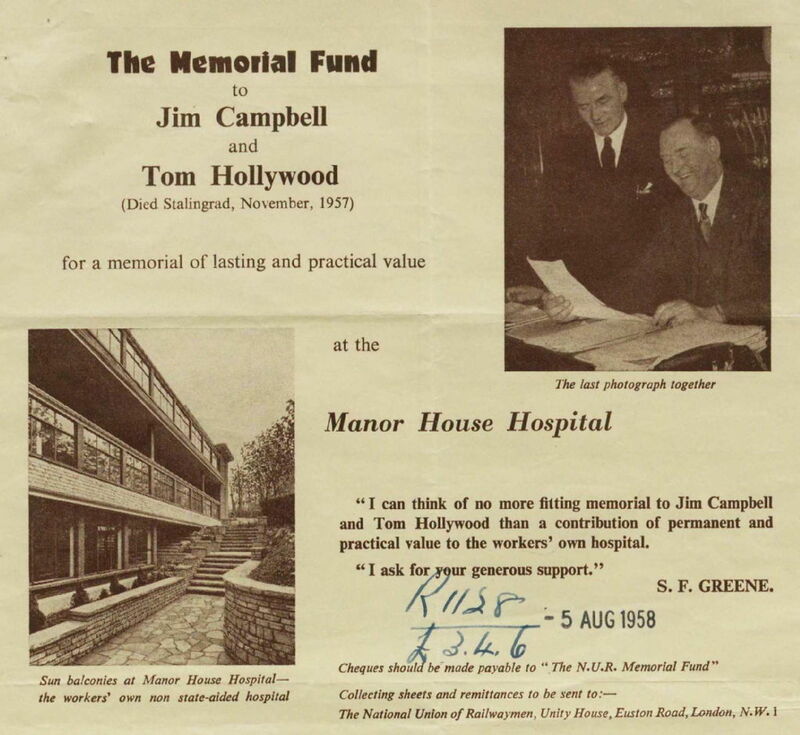 The union collected £7,500 in their memory, which was used to fund the Campbell-Hollywood Memorial Ward in Ivy House, part of the Manor House Recovery Hospital in Golders Green. The ward was officially opened on 12 June 1959. The document on the left is part of a collecting sheet for the NUR memorial fund, including a copy of the last photograph taken of Campbell and Hollywood together [document reference: MSS.127/NU/GS/3/16]. 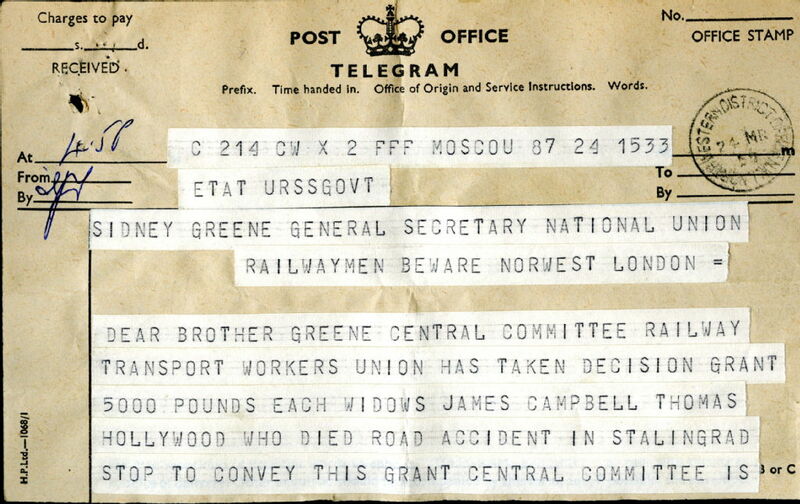 The document on the right is the first page of a telegram from the Central Committee of the Railway Transport Workers' Union of the USSR, offering the widows of Campbell and Hollywood £5,000 each as a gesture of commiseration for their loss [document reference: MSS.127/NU/GS/3/16]. An illustrated report of an earlier NUR delegation to the USSR, in 1946, is available online in full . In 1961 the technical director of ICI, Dr Richard Beeching, was appointed by the government as Chairman of the first British Railways Board, the successor to the British Transport Commission. Beeching's brief was to "modernise" the railway system, and turn the public service into a profitable business. His proposals were published in 1963 in 'The Reshaping of British Railways' (often referred to as the Beeching Report) and included extensive and deeply controversial cuts to stations and branch lines deemed unprofitable, together with major job losses. During the 1960s, the 'Beeching Axe' was wielded by successive Conservative and Labour governments, and by 1969 rail track had been reduced from 18,214 miles in 1961 to 12,098, and the number of railway stations from 7025 in 1961 to 3002 1. Unsurprisingly, the National Union of Railwaymen was strongly opposed to the recommendations of the Beeching Report. 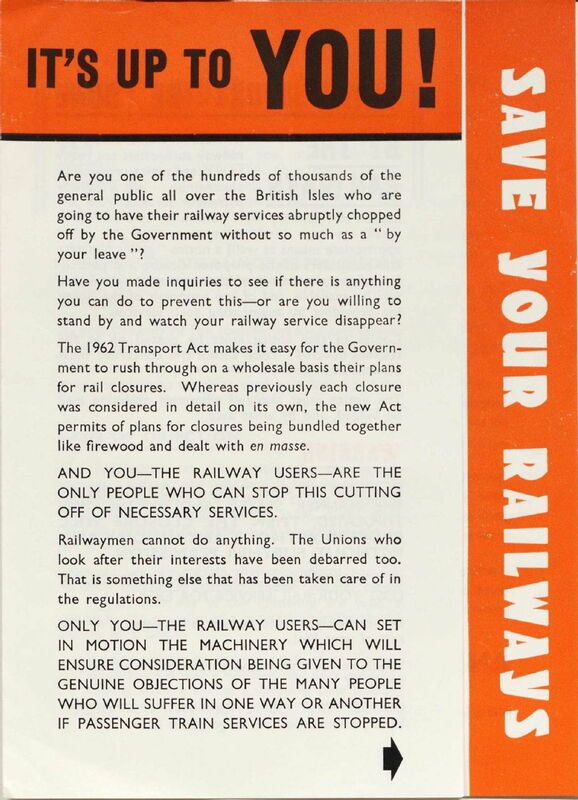 The document on the left is a 1963 leaflet issued by the NUR, which asks the general public to "save your railways" by submitting written objections to local rail closures. This leaflet and a NUR 'Retort ' to the report are available online in full. 1. Statistics taken from the Oxford Dictionary of National Biography entry on Richard Beeching [www.oxforddnb.com], accessed 1 Feb 2013. The victory of the Conservative Party, under Margaret Thatcher, in the 1979 general election marked a major change in British politics. Proponents of the economic theory of neo-liberalism - the idea that the role of the state should be minimised, services should be run by the private sector, and a deregulated economy should be left to the "free market" - were now in government and what little remained of the post-war consensus style of politics was abandoned. 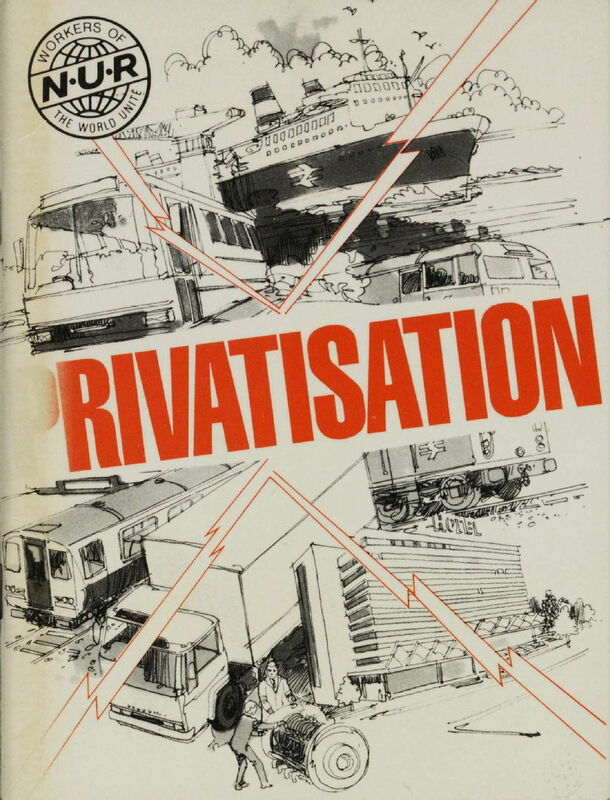 Over the course of the 1980s, the majority of the nationalised industries and services were privatised, including key areas of the transport industry such as bus and coach services, the National Freight Corporation, Sealink ferries and British Railway workshops. The national rail network, however, remained in public hands until 1994, when the 1993 Railway Act, passed by the government of John Major, came into effect. The National Union of Railwaymen, like the rest of the trade union movement, was strongly opposed to the Conservative policies. The pamphlet on the left was produced in 1985 as a contribution to the "combined struggle" against privatisation and argues that "the Thatcher Government's programme of privatisation in the transport industry has been carried out with little regard for the needs of the industry or the interest of the nation" [document reference: MSS.127/NU/4/5/47]. A 1983 anti-privatisation broadsheet issued by a 'Triple Alliance' of coal, rail and steel unions, including the NUR, is available online in full .